Join us for our 1st year celebration on Saturday, July 17th, 2010 for a Poker Run and night ride hosted by the Cheaha Trail Riders. Poker Run registration begins at 4pm and Run starts at 7pm (not a race). Ride until 10pm. Poker Run is $10 per person. Participation not required. Easy drive from Atlanta, Birmingham, Columbus, and Montgomery. 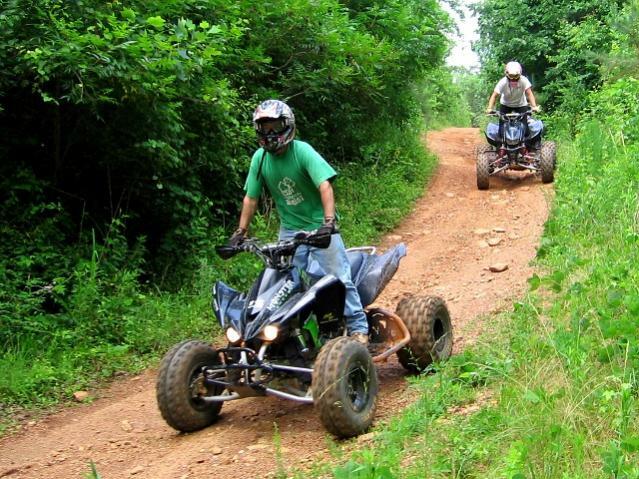 Go to Doc Hilt Trails - ATV park - Home for more info and directions. A few weeks ago, while we were out riding, Mini-Me's four wheeler started acting up. 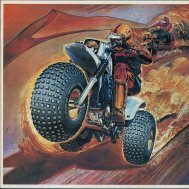 Anything above about ¼ throttle would make it bog real bad and if you didn’t back off the gas it would shut off. Seemed like it was starving for gas or air. No obvious fix on the trail so took it home figuring it was a fouled carb. Took the carb off; not serviceable. Put it back on and the problem was gone. All I did was unbolt it, pull it out, cuss about the shaved screw heads, and put it back. Ran fine for a few days then did it again. Took carb off and put back on again (hell, it worked last time) and while I was at it I bought a good plug and replaced that. Didn’t fix it this time. Ordered a new carb under waranty. Company took three weeks to send me the wrong part. I ordered a new one myself which showed up Friday. Saturday morning I had him ride it pre-replacement to verify issue was still there; it was. Anything over ¼ gas it would bog and die. Replaced carb (fyi – slightly larger – 20mm new vs. 19mm stock) and it was back up and running. Better then before, seemed a little quicker and sounded MUCH better. Adjusted the idle up close (doing it by ear) to where it wanted to cut out when using the throttle – continued to idle fine; no bog. Blipped the throttle and it bogged down. I’m going to go get a can of starter fluid to check for air leaks around intake, some carb cleaner to clean up the carb, and a new fuel filter to replace Chinese one. Don’t expect any of that to fix it, but ruling things out. Also; this may not be related but…. Because of the above I’m thinking maybe an exhaust valve issue??? To tight, not letting pressure out fast enough maybe? Maybe that’s causing the bog when you give it gas??? I’m going to get a set of feeler gauges and check/adjust the valve clearance. Again, don’t expect a magic fix but it’s something to look at. I know these things require periodic valve adjustment, but I can’t see it being out of whack at < 10 hours. I was going to pull the plug, hook it up and ground it while I hit the starter to verify that I’m getting fire, but it starts and idles fine, so no sense in that. I’ll still pull to inspect (correct color, no oil, etc.) just for fun. I don’t think it’s anything mechanical, symptoms/trouble shooting so far just don’t fit. Which leaves electrical; the CDI boxes on these things are know issues, but 99% of the time they are good/no good. So why does it start/idle if that’s bad? I suppose it could be bad and only displaying once the revs come up, but that’s a LOOOOONG shot. Only $5 so if tonight’s tinkering doesn’t fix/isolate the issue I’ll probably get one just to say it’s been replaced. Aside from the CDI there is a battery (for starting only), a magneto, a voltage regulator/rectifier, and a million electrical connections. I haven’t gone thru them all but I can’t believe it’s a bad connection or the magneto because of the repeatability of the problem. It doesn’t come and go on its own; it runs fine, then all of the sudden won’t come off idle without cutting out. Take the old carb off, put it back on; it’s fixed (for a while). Take the old carb off, put it back on, it’s not fixed. Take the old carb off, put a new one on; it’s fixed (for a while). Which leads me back to mechanical, but I’ve checked (almost) all of that. Small chance it’s the valve adjustment, but I’ll verify that tonight. If it jumped timing it would be jacked from idle so I don’t think that’s it, plus it showed up, went away, came back, etc... If timing was off it wouldn’t run at all, or would run like crap from idle on; correct? Oh, also – When I started looking at it last night (right after it started acting up) the air intake (short, curved aluminum “tube” going from the carb to the head) was hot. REALLY HOT. Maybe he over heated it, but before I put the new carb on he test rode it cold and it still did it. Has anyone tried the GPS XII Run Flat tires. We just got a set for hunting season and these are the best thing I have ever seen. If your looking for a tire that you don't have to worry about flats this is the tire. We have purchased many different brands for our machines over the years and nothing like these ever. A little on the pricy side but I have to say well worth every penny. [/ame]. At my wits end here, and months behind on bush work which is what the quad was bought for. PLEASE HELP!